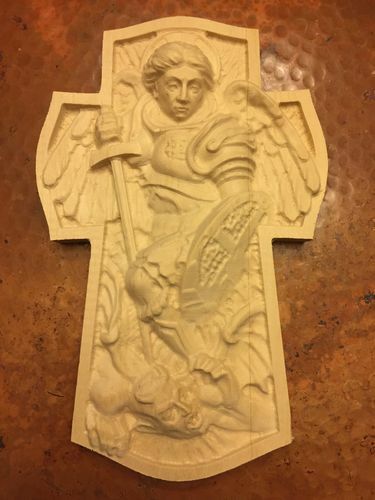 I wanted to carve this St. Michael image since before purchasing my CNC. I cut it from 2” thick bass wood, which turned out to be a poor choice for fine details. I plan to try again with hard or soft maple and see if it comes out any better. I’d say it came out very nice. Looking forward to seeing it in hard wood. I sure wish I could get my hands on a seat of Aspire. I can definitely tell that you are having a great fun with these carvings. CNC carving takes a lot of heat from the “purists”, but I personally think it moves the focus onto the creative act of designing rather than the functional process of carving. Either way, it is still a lot of work. I look forward to seeing more of your projects. 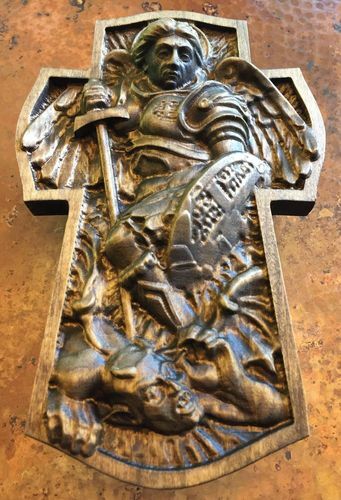 I would like to do some carving like this but I just don’t have the time to even think about a project like this. I like your effort and can’t wait to see it in maple. -- "I never met a board I didn't like!" A quiet compressor for the shop.